Virtually everyone I have spoken to recently has a cold and I also began the week with copious amounts of mucus pouring from my nose (too much info, I know!). Luckily it passed quickly and I’m back on form but it inspired me to share my top 5 simple tips for dealing with a cold and restoring the immune system. These tips are very general as specific symptoms, chronic infections and low immunity will all require individualised treatment. For most of us just suffering from the occasional seasonal chill however, they should suffice. Rest: This is without doubt my top tip for colds. It allows the body space to heal itself which is, or at least should be, the ultimate goal of any treatment. I think the reason I tend to get over colds pretty quickly is that I have no problems at all with being grossly lazy! When I start feeling ill it’s straight to bed with a hot water bottle some ginger tea and a good book. In fact, I secretly quite enjoy getting sick on the odd occasion (don’t tell anyone) as it gives me the opportunity to do just that and no one can make me feel guilty for it. So if you’re one of those Type A personalities thats not happy unless 101 things have been achieved in your day and never give yourself time to rest and recuperate, listen to my words of wisdom and get thee to bed. Steam: A good steam, preferably in a hot bath with some lovely herbs, is wonderful for opening up the pores, clearing the sinuses and helping to move illness out of the body. Teamed with a herbal body rub prior to the bath this is a simple but very effective way to boost immunity. I included a recipe for a bath and shower rub in my post on using essential oils for the immune system here. 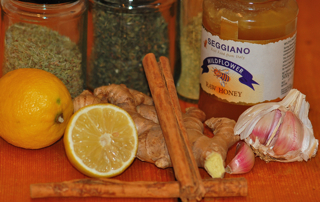 Raid the kitchen cupboards: Ginger, lemon, honey, cinnamon, garlic, onion, thyme, sage. black pepper and rosemary are all useful in treating some of the symptoms of a cold. The majority of households will have one if not most of these things in their cupboards so no special herbal medicine stash is needed to get you back on form. Gargle with sage tea for a sore throat, indulge in a thyme foot bath if you have a cough or make a chest compress using a wrung out flannel soaked in thyme tea. Sip lemon and ginger in hot water with a spoon of honey and finely chop garlic in olive oil to spread on your bread. Make a spicy chai with cinnamon, cardamom, ginger, black pepper, cloves and a pinch of rooibos or green tea to sip by the fire and add herbs and spices to your soups to fight infection and boost immunity. Treating colds is where kitchen herbalism really comes into its own. Diaphoretic teas – Diaphoretic herbs are those that encourage sweating and thereby help to rid the body of infection. If you have a feverish cold but are mostly cold and clammy to the touch with cold extremities you’ll benefit most from warming diaphoretic teas like ginger, cinnamon, angelica, sage, thyme and cayenne. However if you are hot and restless and need to release this through sweating, a cooling or relaxing diaphoretic will be of most use to you. These include delicious teas like Lime blossom, elderflower, catnip, chamomile and yarrow. Most colds are kapha, or damp and cold, in nature (hence the name!) so warming diaphoretic teas will be very helpful. However some colds are more pitta or hot and come with inflammation, sore throats a red face and excessive heat. In these cases a warming, stimulating herb will exacerbate the problem whilst cooling and relaxing ones will allow for a gentle release of tension, heat and discomfort. Elderberry and Echinacea: If you want a bit more support for your immune system then these two herbs are the first port of call for most folks. 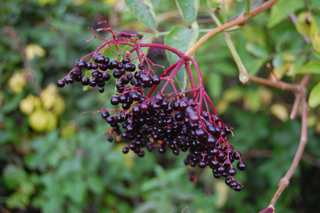 Lots of studies have shown elderberry’s effectiveness in both treatment and prevention of colds and flus and it’s so delicious taken as a syrup that it becomes no great hardship to take your medicine. 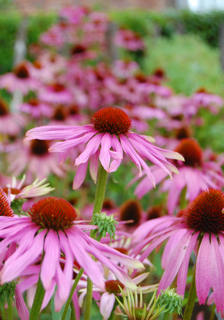 Great as a preventative and at the first signs of illness, Echinacea works on the immune system in a variety of ways so it can also be useful as a treatment once you’re already sick if there is heat and infection present. The root is the part most commonly used but this year I’ve been using a lovely Echinacea seed tincture made by my friend and herb grower Therri. She describes it as more nourishing and supportive than the root which is more stimulating. I made up a mix of equal parts Echinacea seed tincture, elderberry tincture and elderberry syrup and it was impressively efficacious. What are your favourite tips for treating colds? Love all your tips! Steams, hot baths and foot soaks, warming teas and lots of garlic, onions and ginger – they are always my trusted remedies too. I’m also a big fan of soup when I’m sick (or anytime really) and I love adding my medicine right into the broth – putting astragalus, medicinal mushrooms, burdock and lots of spices in, along with beta-carotene rich orange veggies and lots of greens. Food is always my preferred form of medicine! I’m glad you also enjoy the chance to do nothing for a few days! And I do agree that food is the best place to start with medicine, your soup sounds delicious Danielle! Do you avoid astragalus whilst your actually sick or do you find it doesn’t make too much difference in smaller quantities like soup broth? It’s not a herb I’ve worked with much. I like echinacea root and burdock in my soup broth though. Echinacea root in the soup? Gosh! How it comes I never thought to bring this herb to my family as a prevention ‘HIDDEN’ in soup! Since I learned that the Vitamin C content of lemon peel is 3 times higher then in the juice I not only squeeze the juice out but also use the peel in a hot ginger tea. It is great to grow your own lemons since you can be sure they are not sprayed. Yes life will slow us down even when we don’t want it to! I’m a big fan of lemon rind too. I like to dry small slices in the dehydrator and add them to teas. It also contains limonene which protects against cancer. Echinacea root is good in soups as it doesn’t have too strong a taste. We make a decoction then strain it out before adding to the soup. I haven’t tried growing my own lemons, perhaps when I have a proper greenhouse I’ll give it a go! Probiotics is definitely a good tip! One of my naturopathy teachers used to give them for everything, her mantra was always ‘treat the gut!’. Thanks for stopping by and sharing your ideas. There is much debate about astragalus during acute infection. From my understanding, it is quite heating – so not good for a high fever, or for a highly virulent strain of flu with potential inflammatory damage to the lungs. It wouldn’t be as suitable for the hot dry picture you’ve described above. For a cold though, which tends to be sort of low grade and lingering, I think it’s fine – great for the cold and clammy picture with a low grade fever that needs some prodding. The dosage in soup is also low enough that I don’t worry much. If there is any question about its suitability, I wait until the acute hot stage of illness is over (fever, inflammation, etc) and use it as a convalescent herb while I recover. Hope that helps! I love the thought of using lemon peel! I found a recipe this summer for lemonade made with peels and all, which makes it just slightly bitter and oh so good 🙂 I think it was from Nigella Lawson. Ok, sorry to write a book. Thanks for this Danielle! That makes lots of sense.